Do you have a special someone who loves all things fiber? And you don’t know where to begin to get that unique gift that they will always remember? You can provide them with the ultimate fiber experience, weaving cloth on a loom with a professional weaver as your guide. Both individual and small group opportunities are available. We can meet in my studio, or I can come to you. 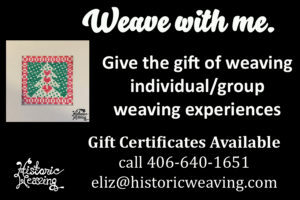 Don’t know if they would like to weave or purchase a gift from my studio? A gift certificate can do it all and there no size or colors to worry about. This entry was posted in blog, Lessons and tagged Christmas, Gift, Gift Certificate. Bookmark the permalink.